We're mailing strange this to see how the post office works and how it handles oddities. We don't post often, so you might want to get on our mailing list to find out when we have new strangeness... or maybe receive some of this mail art yourself. 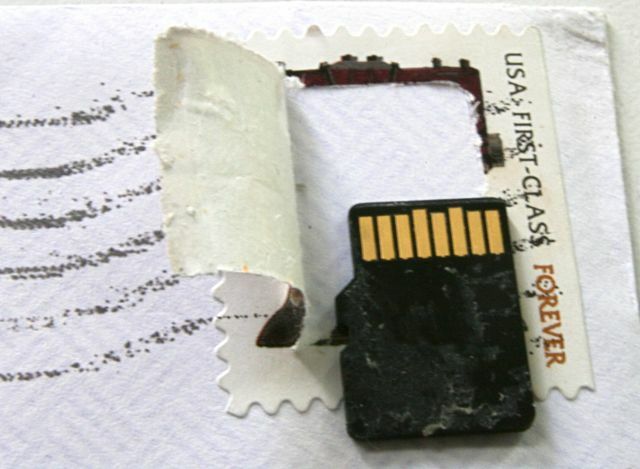 For fun, this letter was mailed with a MicroSD card under the stamp. The card was loaded with files and MD5 hashed – the hashes verified when it was delivered. In addition to the chip not being damaged, even the post mark seemed to work against the small “bump” in the stamp. Chances are probably good that regular SD chips could be mailed under larger, commemorative stamps. 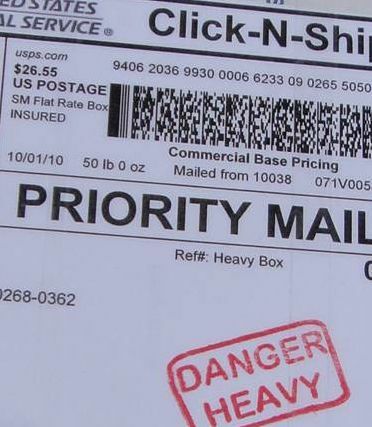 How much weight can you jam in one of those small, Flat Rate Priority Mail Boxes? Well, our metal fellow has done it again, this time with a block of Tungsten! 50 pounds (over 22 kg) in a box smaller than a Harry Potter. We couldn’t beat that with depleted uranium! I had a package being shipped from the U.K. to the U.S. Normally Royal Air Mail is very zippy and getting packages from across the puddle is similar in speed to getting packages from California. This package took over a month. What amazes me the most is that packages being “mis-routed to India” is so common that they have rubber stamps for it. Someone emailed me and asked if they could send this package. I’m glad I said “yes” because I have had a blast passing it around and showing it to people. 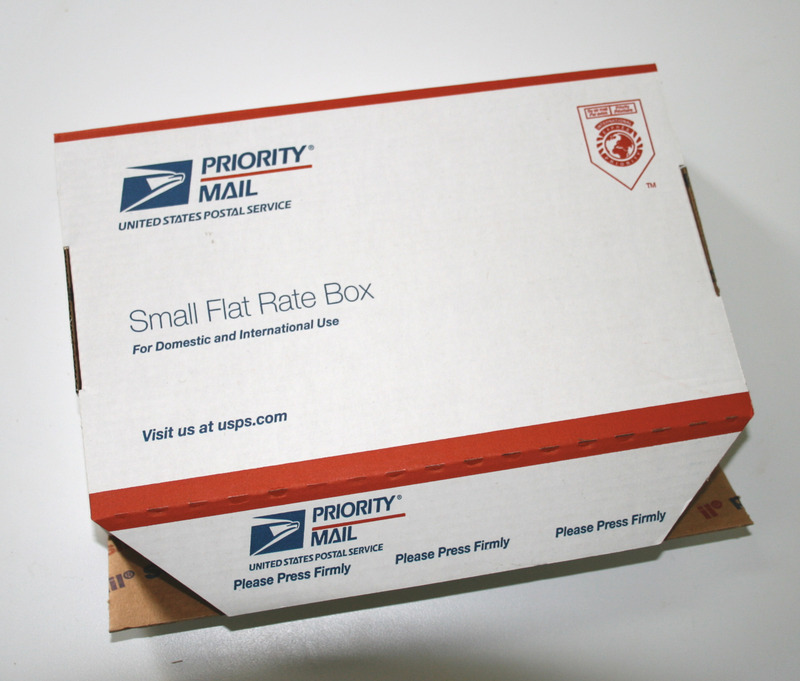 The package is a Flat Rate Priority Mail box the size of a VHS tape. Inside is a block of milled lead cut to fit the box. WOW! 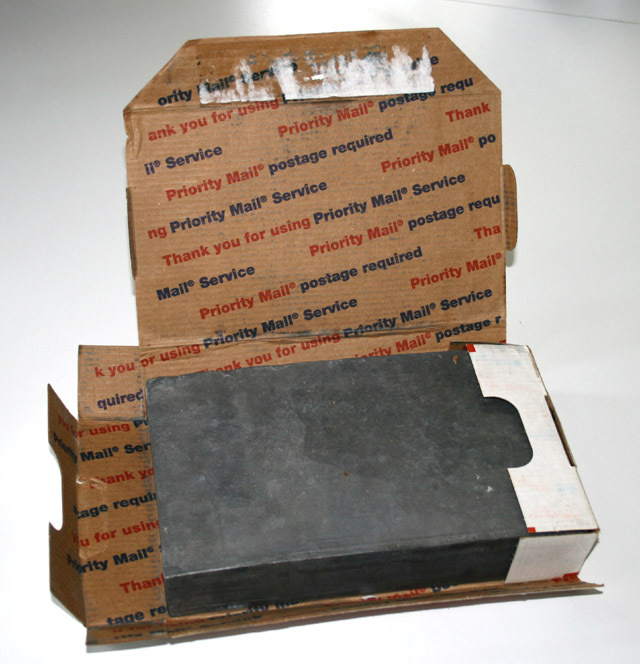 It’s very surprising to move it or pick it up, which is why the sender had the foresight to make their own rubber stamp to warn mail handlers of this unusual characteristic. 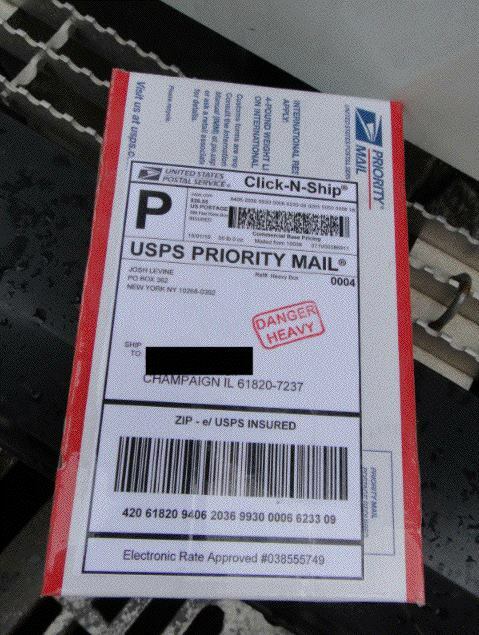 Remember to always be safe with the mail – we don’t even want them to break a nail. While it’s not my goal to solicit weird articles to post on this site (there’s already Wired’s Return to Sender Contest and Post Secret), someone sent this odd piece of mail and I decided to share it. I’m not exactly sure who sent it, but I suspect someone from Jelly. The box is a clear plastic box sold at hobby stores for displaying autographed baseballs. 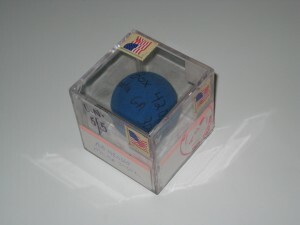 Inside is a blue racquetball with my address written on it. 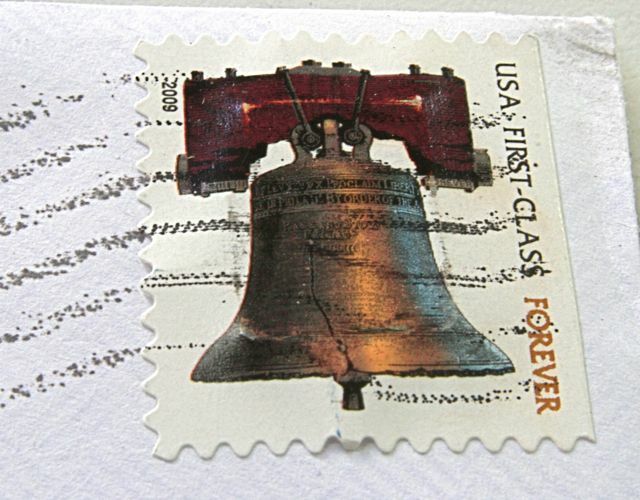 The sender put fractional postage on several sides. The post office added the two white stickers. Those are actually stickers from the counter postage machine. 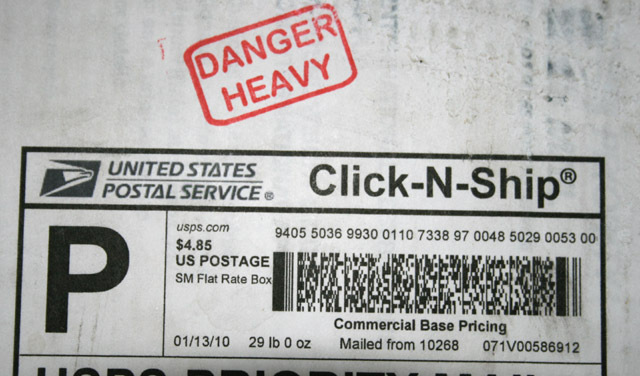 When you send a package, they print the postage barcode on a sticker with that orange stripe at the top. They used one sticker to display the originating postmark clearly and another one to write the address on. Since they wrote the entire address, I assume it was someone at the sending post office. Delivery time was only two days. Again, the point is to send your own weird stuff to people you know. My PO Box is small and stuffed with my own mail, so they leave a note telling me I have to take off from work to come to the counter during business hours. That’s not entirely bad as I got to enjoy the clerk’s befuddlement as they brought the package out from the front and got to talk to them for a little while about the postal system. Anyway, thanks for sending it. I’m happy to announce we’ve successfully mailed uncooked eggs. Actually, we drilled a small hole in both ends and used compressed air to remove the insides. Not only did this remove the concern that the eggs might smell bad, but the hollow shells are even more fragile. 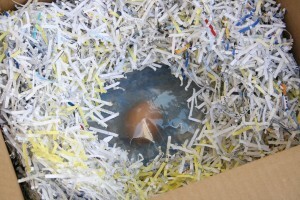 The egg was sandwiched between two ziplock bags filled partially with air, leaving it suspended on an air cushion. The bags were placed in a cubic foot sized box filled with paper shreds. 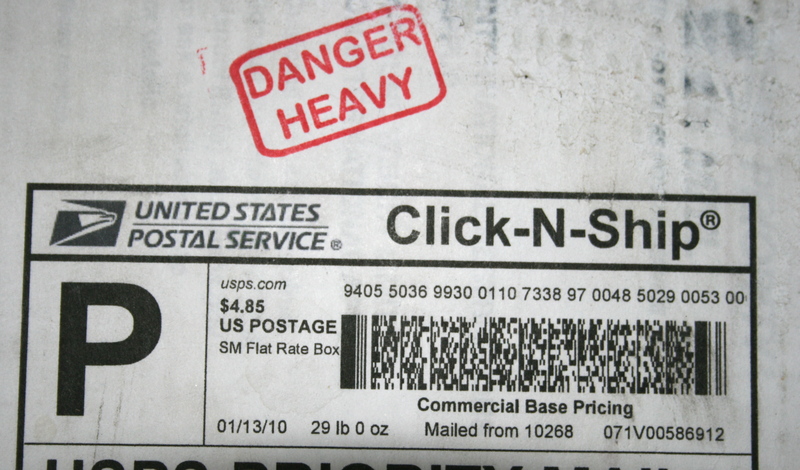 It was marked fragile at the post office and mailed Parcel Post (the slowest way). We discussed the contents and packaging with the counter clerk and he was certain it would make it. So, all of you doing the “pack an egg” project with your schoolkids now know how to have a winning egg. 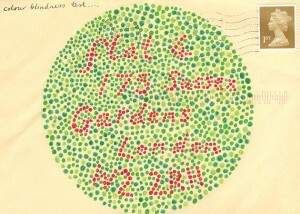 She has a book coming out soon as well, already listed on Amazon: Envelopes: A Puzzling Journey Through the Royal Mail . While the videos are out on torrent sites, I have two copies right here for download. This is a 350MB version MP4 and this is a more compressed, but almost as readable 70MB Version that is faster to download and/or takes up less iPod space. Audio versions of the HOPE presentations are now on-line at http://www.thelasthope.org/talks.html, including my presentation. Thanks again for HOPE putting these on-line! I’m already getting comments from people who missed HOPE, but heard the presentation on-line. Notes from The Last H.O.P.E. A big thank you to everyone who came to my presentation, and special thanks to all the people who help make H.O.P.E. happen. Here are the links promised. Powerpoint. This is “last week’s version” so it is slightly different than what I presented. I’ll have the exact version posted (plus an HTML version) and possibly the audio as soon as I catch up on sleep. Subscribe to the RSS feed to find out about updates. Then there are wags who like to match wits with the post office. 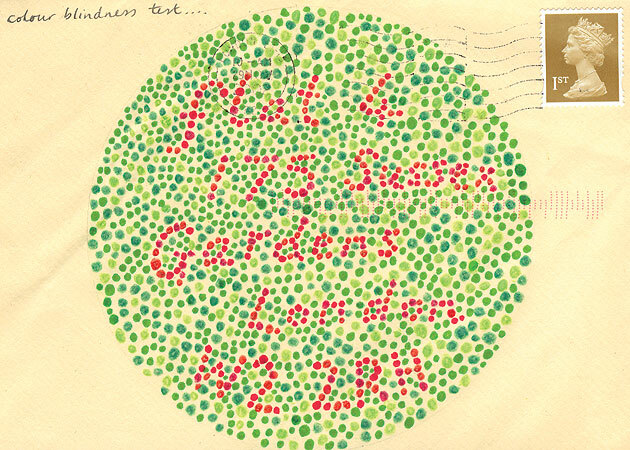 Some address letters in Morse code, in musical notes or by telephone numbers (the latter are ignored). The chemically minded use such tricks as H20 Town for Watertown. Wow! I’m participating in a time-honored tradition. My friend, James Dean, gave me this Wal-Mart promotional piggy bank. It’s about 30cm round and has been my favorite package to send. It’s roundness causes lots of fun. 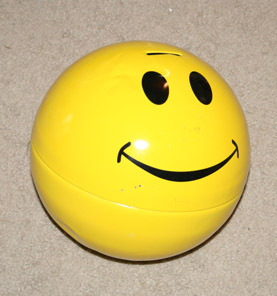 When I mailed it to my parents, the clerk put it on the scale to weigh it. It promptly rolled off and made a nice WHAM when it hit the floor. The postal clerk picked it up, put it back on the scale and went back to typing in the zipcode. The package went back to going WHAM on the floor. Eventually the clerk stacked some office supplies on the scale, reset it to zero, and weighed the package. After applying the postage, the clerk decided to “put the package in the back.” Apparently, it rolled off the table a few times as we heard various WHAMs coming from the back room. It was delivered full of dents, but did make my parents’ day. If you’ve ever had a post office box, you’ve probably noticed that those “extra” four digits of a zipcode are the last four digits of your box number. Street addresses have those as well, but there can be many addresses that have the same 9 digit zip code. They are useful for doing things like separating one side of the street versus another and helping the mail carrier put the mail in the order they will deliver it. A friend of mine suggested that if you have a post office box, you really don’t need to address it – just put the entire zip code on it. To make matters more fun, maybe you just need the barcodes? So, we tried it. With just the address, the envelope made it. Even better, it was delivered on the same day as a normally addressed envelope mailed at the same time. 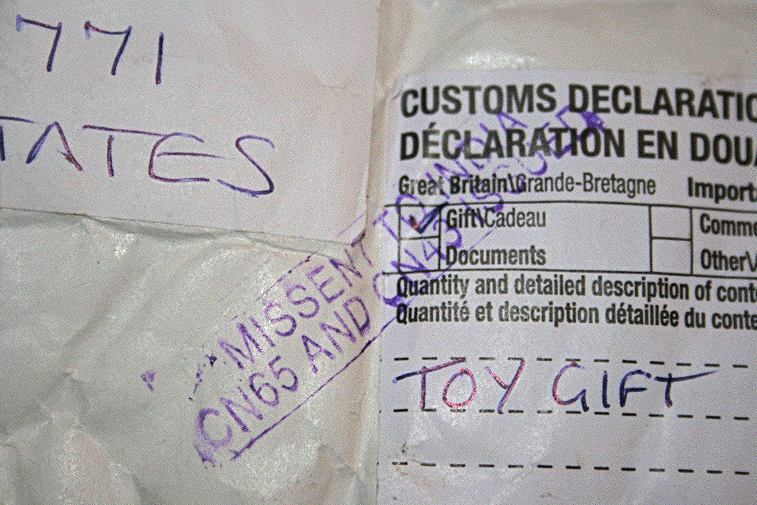 They even sprayed a set of barcodes on the envelope. With just the barcode, we were not as lucky. It was returned to the sender. I have seen cases where an envelope that was barcoded by the sender received an additional POSTNET code sprayed on the bottom of the envelope. I’m not certain why that sometimes happens. Perhaps it is just a variation of equipment in the sorting facilities. Nevertheless, you cannot consistently get a mailpiece delivered in this fashion. 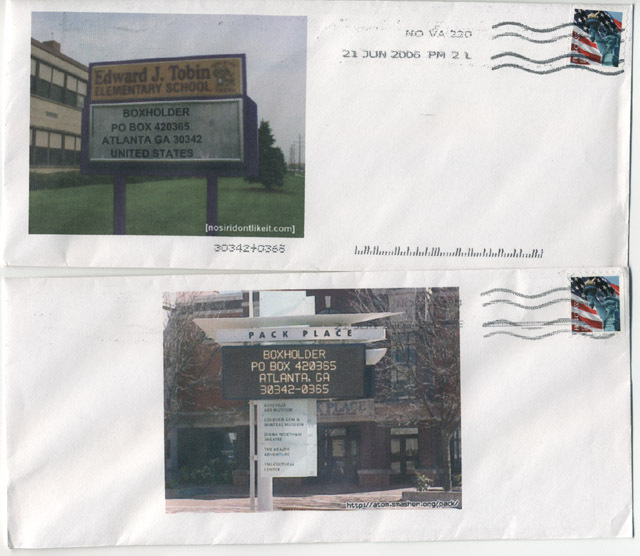 Here are two envelopes that were addressed with images. You can find lots of on-line programs to make these kind of images at generatorblog.blogspot.com. In testing many of these images, we have had some postcards that were lost in the mailstream, but cannot reproduce the problem consistently. Upon resending lost cards, they always get delivered. While these were mailed from the same place at the same time, I don’t know why one has a barcode at the bottom and the other does not. 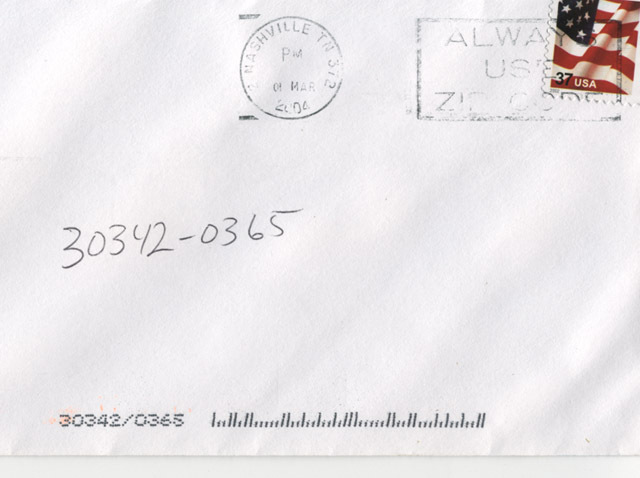 The tall and short bars on an envelope represent the destination zip code and are used to help machines sort the mail. But what would happen if the barcode was wrong? This envelope has the wrong POSTNET barcode. 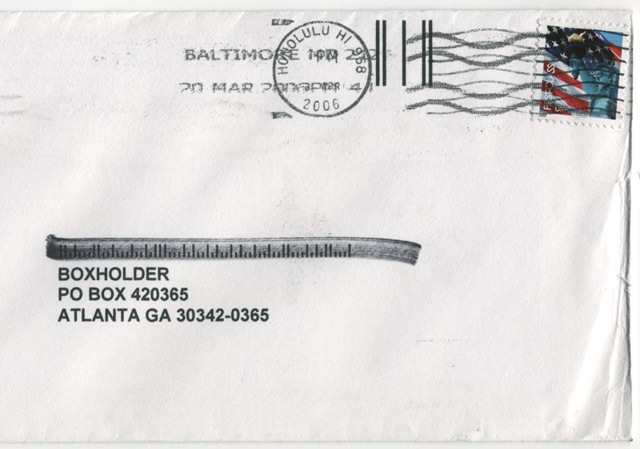 It was sent from Baltimore to Atlanta, but we coded it for Hilo, Hawaii. As expected, the envelope went to Hawaii. Postal employees marked out the barcode (and the orange code on the back) and just dropped it back into the mail. This envelope took two weeks longer than a properly addressed envelope mailed at the same time. 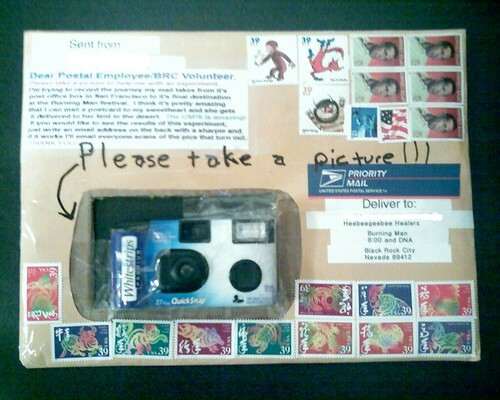 So, if you want to mail something but not have it delivered promptly, this is one way to do it. The most interesting thing is that it has a second postmark from Hawaii, which proves that it actually made the journey as opposed to just being delayed somewhere on the mainland. Here we sent an envelope with a hole in it. 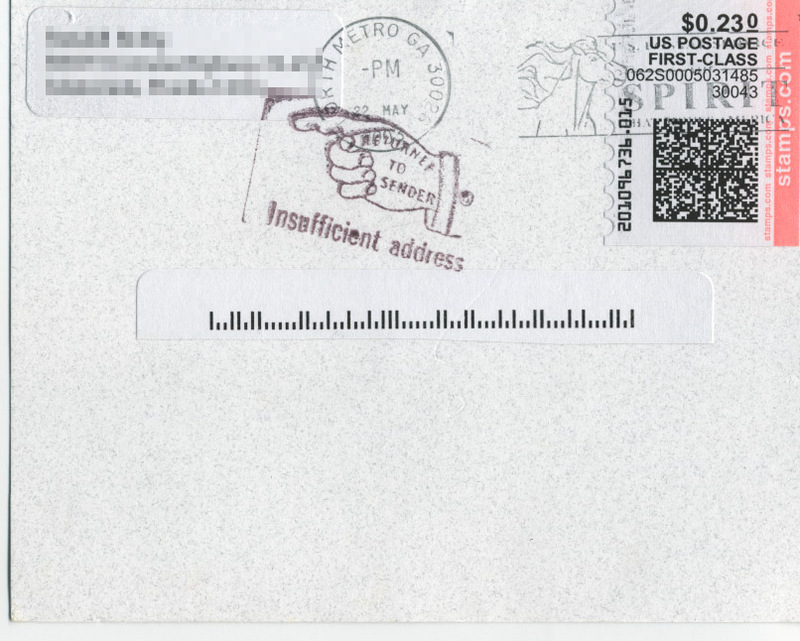 Since windowed envelopes pass through the mail stream without any problems, we weren’t sure if this “holy” envelope would cause a problem or not. The fact that it was empty made it thinner than a normal envelope and contributed to the wrinkled appearance. However, it doesn’t appear to have been jammed or torn. Looks like it made it. I need ideas on more advanced objects with holes. I know that tires have been sent without problems. A hula-hoop is typically too large and ringed frisbies are too strong to sustain any damage. One of the fun things to do with the post office is experiment with addressing. How many ways can you mess up a mail piece and still get it delivered. The post office is amazingly persistent, although some things do slow it down. 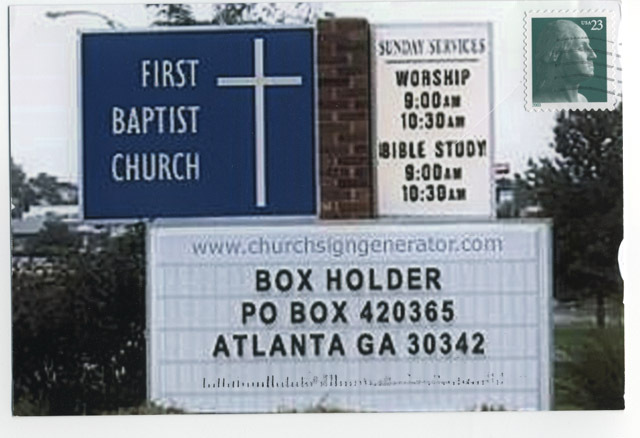 Here, we made a postcard using the image from http://churchsigngenerator.com/. The postcard took an additional 4 days for delivery compared to a normally addressed postcard mailed at the same time. Note the tall/short POSTNET barcode sprayed on the bottom. One day, I read somewhere that the postmaster of Bedrock, Colorado grew so tired of processing mail addressed to Fred Flintstone and Barney Rubble that they had a stamp made especially for rejecting such mail. I had to see this, so I mailed a letter to the the 850 person town of Bedrock. The results did not disappoint. This cartoon reminds me of one of the first postal pranks I can remember. Maybe in 6th or 7th grade, my Boy Scout leader sent himself a “letter” while we were at summer camp. Each day he would run up the mail call asking if his letter had arrived. After four or five days, his letter, a single sheet of paper with a big “letter A” on it had arrived. Anyway, if Art Bohannon is out there, he now knows that he created a monster!